What is the probate process in California? 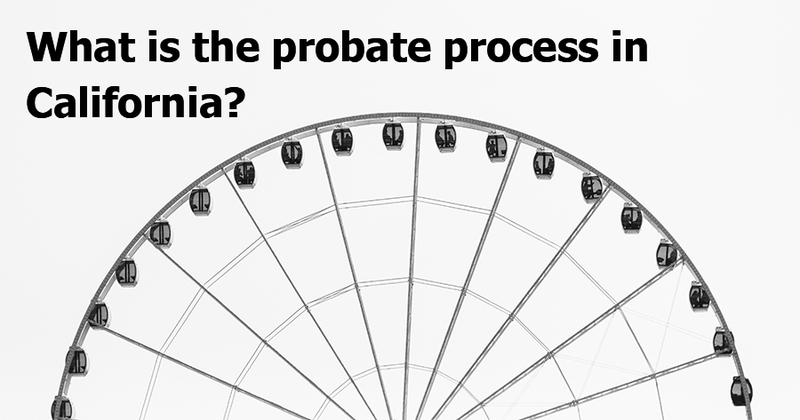 Dealing with the complicated probate process can feel like a never ending ride on a Ferris wheel. Just when you think you are about to get off, up you go again. Probate is a legal process of administering the estate of a deceased person. Probate includes the verification of a will, the settling of a decedent’s obligations and the transfer of property from a deceased person’s estate to their heirs and beneficiaries. The probate process can take a long time to complete – in some cases, proceedings can continue for more than a year. Now that’s a long ride. While court officials generally handle the process of verifying a will, the other probate duties are often handled by a person appointed by that will, called an executor. If no will is available, and therefore no executor named, the court generally appoints an administrator to handle those duties. While under the supervision of the courts, the person who is charged with the duty of estate administration must identify and conserve all assets of the estate and settle outstanding balances and debts that are attached to the estate before distributing these assets to those who have the legal right to inherit. In some cases, the probate process may be a requirement for distribution, but in others, a person might be able to inherit property through simplified mechanisms. For example, a person might not have to appear in court depending on the size of the deceased’s estate. If the decedent’s property was less than $150,000, and a person has the legal right to inherit those assets, they may not be required to go through the probate process. However, if the value of personal property is above $150,000, there are no exemptions and the case must be taken through the court process. It should be noted that the term “personal property,” which is connected to the $150,000 threshold does not include certain assets, such as cars, real property (land) held outside of the state, and assets and accounts that are jointly held. A lawyer who is familiar with estate planning and administration could provide an individual who is involved in the probate process with additional insight into his or her case. For more information on the probate process and estate administration, please visit our estate administration practice area page HERE.